Other Pet Urine Odor Remover! Nature’s Secret Weapon works by destroying natural smells at their source. Our natural dog and cat urine odor remover works exceptionally well in removing even the strongest smells. The secret behind our success is our patent pending “instant” odor encapsulation technology. Nature’s Secret Weapon works great for both dog and cat smells. Our advanced “all natural” formula is 100% guaranteed to be the best all natural dog & cat urine odor remover you’ll ever use! We don’t think you’ll find a better product at any price. You don’t have to compromise when buying Nature’s Secret Weapon. Our dog & cat urine odor remover is completely safe for use around pets, children and plants. Read our customer testimonials and you’ll know why they’re sold on our product. How Does Nature’s Secret Weapon Work? Our dog & cat urine odor remover works in a 2-step process. The first stage incorporates our advanced odor encapsulation technology which instantly microencapsulates odor molecules from any biological source. Any dog & cat urine odor remover should really have an instant component built into it for pet owners. Cleaning up pet urine is much easier when it doesn’t smell. When choosing a dog & cat urine odor remover, be sure to check and see if the product offers real instant odor removal, or just a cover-up scent. In the second stage of our dog & cat urine odor remover, the smell (an organic carbon source) is converted into harmless carbon dioxide through a natural process called Organic Bioremediation. Nature’s Secret Weapon’s dog & cat urine odor remover is very easy to use. For spot treatments, just mix 1 part Ultra Concentrate with 2 parts water and spray the soiled area. When using our dog & cat urine odor remover, it’s best to keep the treated area slightly wet for several hours if possible. Covering treated areas with plastic works great. Some people just use a trash bag and throw it away afterwards. Our dog & cat urine odor remover should be shaken well before each use. Each gallon of our Ultra Concentrate contains over 3 billion natural microbes, making proper agitation necessary for even microbe distribution. Before mixing, make sure to thoroughly clean the spray bottle by washing with warm soapy water and then rinsing several times. This helps to avoid product cross contamination. When applying our dog & cat urine odor remover, remember to apply enough solution to saturate the areas urine has traveled to. With carpeting for example, treating the carpet padding is also necessary. 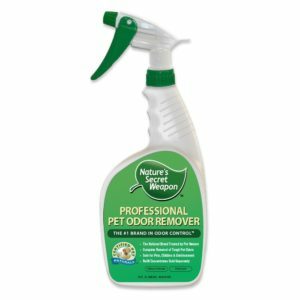 Nature’s Secret Weapon dog & cat urine odor remover also works great to knock out smells quickly when unexpected guests show up.